Hydraulic presses produce power, useful for fabricating any number of tools, prototypes and components. But the power that makes them so essential for industry can also cause problems for operator s. That’s why RK Machinery builds safety into every machine. To further protect operators and workers in the vicinity of your hydraulic press, the company now sells its Security Kit. Here is a look at hydraulic press safety considerations, based on OSHA safety standards, and a look inside the Security Kit. At each of these points, because the operator is interacting with the press, an accident can happen. For example, hands or other parts of the body too near the press can lead to serious injury. And, as is often the case, material fed into the press can have sharp edges, be cumbersome and heavy, or have a slippery texture. All of this means an accident can happen. Worker safety isn’t just a machine shop concern. In both Canada and the U.S., there are legal requirements to keep workers safe. In Canada, it’s the Canadian Centre for Occupational Health and Safety. In the U.S., it’s the Occupational Safety and Health Administration. The first, and most important, step for shop safety is proper training for all operators and workers in a machine shop. When the dangers are explained thoroughly to employees, they know what to be aware of and how to protect themselves around a hydraulic press. The second is a clean, decluttered work area. This reduces confusion, and can prevent slips and falls. For over three decades, RK Machinery has been making hydraulic presses in North America that are considered operator-friendly. For example, the front security guard, standard on all presses, is a basic method of increasing safety. To boost safety for hydraulic press workers, they have released a Security Kit, based on OSHA safety standards. It contains several add-ons that can reduce the potential for accidents. For worker protection, the press automatically switches to jog mode at low pressure when any of the four guards are opened. The operator can get around this by turning the key to the on position. When he does this, the press moves to full pressure, even if the guards are open. 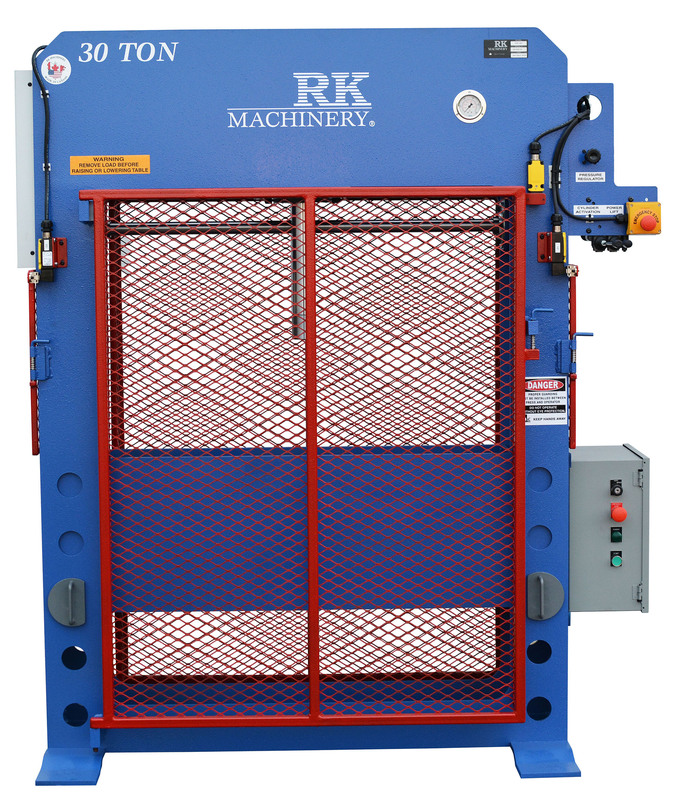 RK Machinery is proud of its reputation for customizing hydraulic presses to suit any need. The same is true of its Security Kit. The company can adapt the components to fit the requirements of your shop. Interested in boosting hydraulic press safety in your shop? Call RK Machinery today to find out how the Security Kit can keep your workers protected.